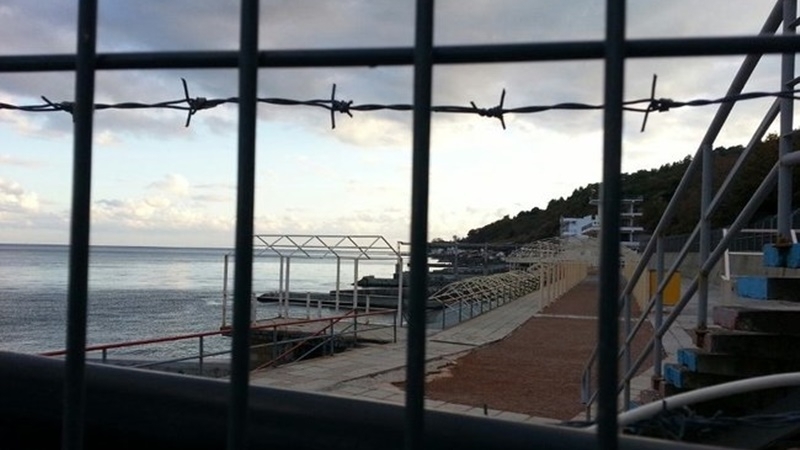 Fences were built at the Yalta railway station "for the convenience of people"
In the occupied Crimea, the so-called authorities began placing fences along the coast. On the Yalta embankment, the occupiers left a narrow pedestrian path with high fences on both sides, which goes along the sea to Livadia. The fenced off territories were "privatized". The southern coast of the Crimea was also fenced off by a high "Mahon" security fence with punches designed for installing sensors. It is used as an additional fence, but in the Crimea it is put instead of the main one, since the "Mahon" of Russian production is two to three times cheaper than a welded grate. The occupiers built fences also on the embankments of Yalta and near the Yalta station, the platform of which is also fenced and guarded. Director of the State Automobile Unitary Enterprise Krymavtotrans Igor Korobchuk said that temporary fences and their placement will be adjusted for the convenience of people. Reportedly, this season the occupiers decided to reduce prices for vacation in the Crimea. The so-called minister of resorts and tourism of the occupied peninsula Vadim Volchenko said that the “authorities” had prepared an agricultural complex to supply all groups of goods directly to tourists.